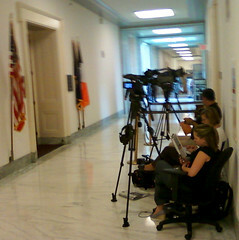 While walking through the halls of a congressional building on Tuesday, I noticed several people reading next to cameras. It seemed odd until I realized their cameras were aimed at the office of Representative Anthony Weiner (D-NY). Guess these people can finally go home now from their stakeout.